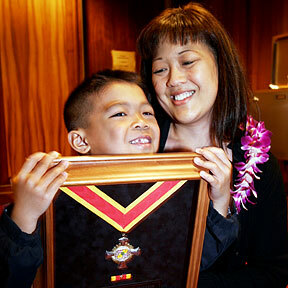 HAWAII MEDAL OF HONOR: (My son) Kyle still looks at pictures at our house and wishes his father was there," said Kelly Bolor. Mother and son were at yesterday's ceremony at the state Capitol. Rate hikes put off since 1995 are now needed as costs rise, says the water board. Lawmakers have until April 28 to settle on any change to the law. A benefit dinner takes diners 'back to the roots' of the Filipino plantation days. The pipeline from the Pacific Northwest continues to flow for Hawaii basketball. Dell's MSD Capital and the Rockpoint Group have agreed to buy the Four Seasons Resort Hualalai. Several retired generals have called for the resignation of Defense Secretary Donald Rumsfeld.